Does your washing machine sound like a jet plane? If it does not, you can thank modern adhesive technology for this. By contributing to energy efficiency and noise damping, KÖMMERLING products protect your nerves at home every day. The complex technology of modern household appliances requires steadily increasing product quality while demanding cost reduction at the same time. This can only be realised through a high degree of automation. Professional manufacturing processes are supported by KÖMMERLING with an innovative portfolio of adhesives and sealants. We make household appliances lightweight, low-noise and energy-efficient – talk to us. An effective soundproofing technique can be realised with sprayable damping adhesives. So-called Liquid Applied Sound Deadener (LASD) significantly reduces the noises generated by household appliances (whiteware). 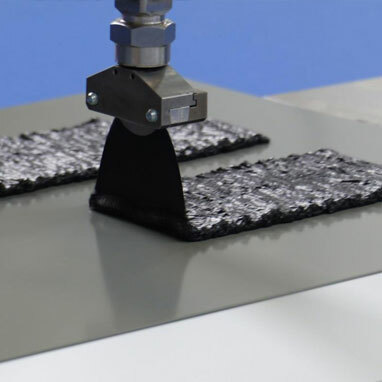 Modern damping materials are sprayed in thin layers onto vibration-prone components such as washing machine or dishwasher bodies using robots. The acoustic performance of LASD is much better than that of traditional bitumen mats. At the same time, a quite significant amount of weight can be saved if they are used. 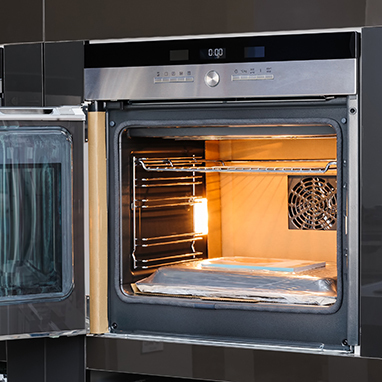 Household appliances during whose use high temperatures are generated, such as in the case of ovens, microwave ovens or irons, require adhesives that have excellent temperature resistance. They must also have very good elastic properties in order to balance the different elongations of the bonded materials. High-temperature silicones fulfil these requirements superbly and thus enable efficient assembly of glass, plastic and metal.